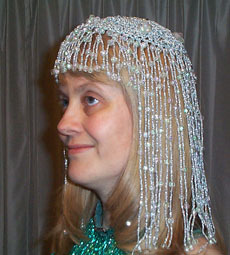 This headdress offers a way to vary the way your hair looks. I particularly like wearing one of these when planning to dance with a sword outdoors. It helps hold the sword in place even when a gust of wind comes along. Chain 7, and join in a ring with a slip stitch. Round 1. Chain 4, make 13 treble crochet in the ring, and slip stitch in the top of the beginning chain. Round 2. Chain 4, treble crochet in the space between the two stitches closest to the hook, then treble crochet in the top of the next stitch. Repeat around, and join to the top of the opening chain 4 group with a slip stitch. Counting the beginning chain 4 group, this gives you a total of 28 treble crochets around. Round 3. Chain 4, do 2 treble crochet in the space between the two stitches closest to the hook, then treble crochet in the next stitch. Repeat around, and join to the top of the opening chain 4 group with a slip stitch. Round 4. Chain 4, and do 1 treble crochet in each stitch around. Join to the top of the opening chain 4 group with a slip stitch. Round 5. Chain 4, and do 1 treble crochet in each stitch around. Join to the top of the opening chain with a slip stitch, and fasten off. Cut 40 pieces of cord, each 28 inches long. Use a lark's head knot (see a macramé book for instructions on how to do one) to attach the center of each cord to the gap between two stitches on the cap. String some large plastic beads onto the cord at varying intervals, and use a drop of glue to hold each bead in place. To make "bangs", attach shorter pieces of cord to the remaining intervals on the cap. When wearing this headdress, you may need to use bobby pins to secure it in place and keep it from slipping out of position. If your hair is too thin to anchor bobby pins, make some tiny ponytails in your hair in the spots where you want to place the bobby pins, and then run the bobby pins into each ponytail to secure them. If you have recently washed your hair, it may also be helpful to put some hair spray on the top of your head before you put the headdress on to make your hair slightly sticky. Making an Egyptian Pharaonic Costume. By Arabella. Includes another headdress idea. Costuming for the Hair. By Shira. What Is Pharaonic Dance? By Shira. Exploring the dance of ancient Egypt. Ask the Costume Goddess: Hair Styles for Long Hair. By Dina Lydia. Ask the Costume Goddess: Hair Styles for Short Hair. By Dina Lydia. Ask the Costume Goddess: Headdresses. By Dina Lydia.